Wensum White; winner of a Silver and a Super Gold Award at the World Cheese Awards 2014! This is our newest goat cheese which is going down a storm, Wensum White is a brie style goat cheese. Melt it, bake it and dip in it, or just eat it as it comes, we know you will love it! Wensum White Portions are approximately 180g. Also available in whole squares of approximately 350g-450g. Please note that we use vegetarian rennet in all our cheese. Norfolk Mardler – (to Mardle; from the Norfolk dialect meaning ‘to gossip or chat’). A waxed, eight week matured goat cheese which is deliciously creamy – this cheese melts particularly well. One of our favourite recipes is a goat’s cheese and spinach tart – delicious! A whole Norfolk Mardler weighs approximately 1.2kg. If you can’t manage a whole one then we also sell Norfolk Mardler portions. Please note we use vegetarian rennet in all our cheese. A whole Norfolk Mardler weighs approximately 1.2kg, but if you can’t manage a whole Mardler, we’ll cut it up for you. Our very first goat cheese, the Ellingham is a soft, feta type goat cheese ideal for salads or for simply eating on it’s own with crackers or bread. Available in two different sizes, we know you will find it very moreish! A larger version of our Ellingham Cheese, perfect for a party or wedding! And it’s suitable for vegetarians. NB: Please note this product requires a minimum of 1 weeks notice. 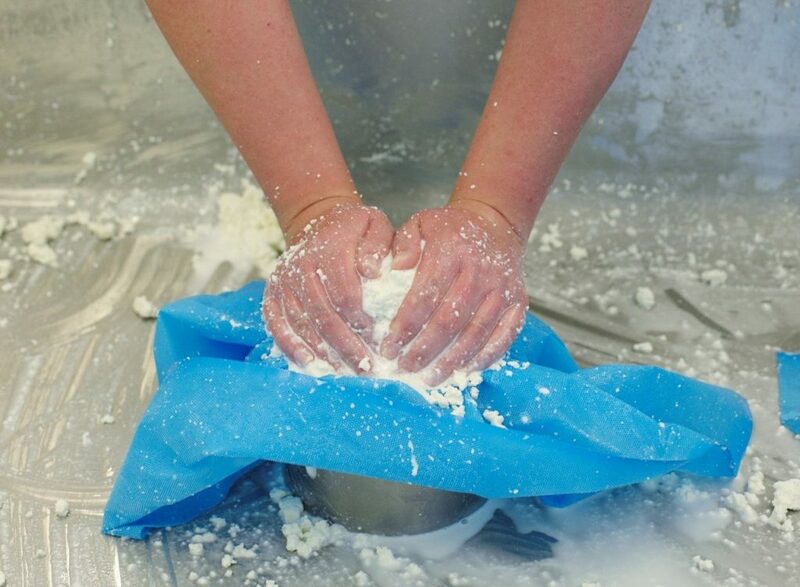 Our very first goat cheese, the Ellingham is a soft, feta type cheese ideal for salads or for simply eating on it’s own with crackers or bread. Available in two different sizes, we know you will find it very moreish! Our Small Ellingham weighs a minimum of 100g, and can easily be consumed in one sitting! Also available in as a Large Ellingham goat cheese. A smooth, spreadable version of our ever popular Ellingham goat cheese. Scrummy stuffed in peppers, mushrooms and jacket potatoes, or just smothered all over some freshly baked bread. Our Fielding Cottage Goat Curd comes in 160g tubs. Pasteurised goats’ milk, available in 1 litre bottles and sent out overnight. Please note that all our milk is pasteurised and we bottle milk once a week on a Monday. Orders placed before midnight on a Sunday will be sent out on Monday or Tuesday on an overnight service. Orders placed after the Sunday night deadline, will be bottled the following Monday. Please contact us if you have any questions. Goats’ milk is the milk of choice in most of the world. Perhaps the greatest benefit of goats’ milk is that some people who cannot tolerate cow’s milk are able to drink goats’ milk without any problems. Many find it easier to digest and we were given goats’ milk as children for this very reason. Furthermore, allergy to cows’ milk has been found in many people with conditions such as recurrent ear infections, asthma, eczema, and even rheumatoid arthritis. Replacing cows’ milk with goats’ milk may help to reduce some of the symptoms of these conditions. Our latest product, these Fielding Cottage goat meat Billy Burgers have been going down a storm on BBQ’s. Made by our local butcher with 99% goat meat and a light, fruity seasoning, these burgers are gluten free, low in fat and low in cholesterol. Each pack contains 4 burgers, approx weight 100g per burger. Please be aware that Fielding Cottage Goat Billy Burgers may be frozen. If you wish to order fresh meat, please call or email us first to check availability. The most versatile cut of goat, widely used in warming curries and stews. Each pack contains 0.5kg diced kid meat (off the bone). Please be aware that our Fielding Cottage diced kid meat may be frozen. If you wish to order fresh meat, please call or email us first to check availability. Our Fielding Cottage goat leg joint is one of the most popular cuts of meat, and is perfect for slow-roasting. Our goat legs are sold on the bone to allow a richer, fuller flavour. A leg of goat weighs approximately 1.5kg. Please be aware that our Fielding Cottage goat leg may be frozen. If you wish to order fresh meat, please call or email us first to check availability.